Greece can get pretty hot. 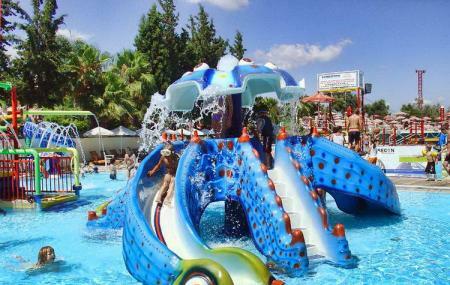 That’s why people of Chania head out to this fantastic little water park. It’s not got much, only 11 rides, but those 11 are spectacularly fun and addictive. This water park offers fantastic rides, slides and water fun. Limnoupolis is located in a green, scenic area which sets it apart from many other parks of its kind which are often sadly devoid of vegetation. There’s crazy rides, mellow rides, a play area for kids, a Jacuzzi… and even a video game area. A rope suspension bridge passes over the main pool to an artificial island in the middle. Check out the pool bar and restaurant too. EUR 15 for (4–12) years of age. Take flip-flops, sunscreen, hats and sunglasse it’s quite hot in Crete. How popular is Limnoupolis Water Park? People normally club together Nautical Museum Of Crete and Ancient Aptera while planning their visit to Limnoupolis Water Park. By far the best water park in Greece. It has epic water slides, huge pools to swim and awesome minigames like Tarzan. You can go with friends or family, especially if you have kids, and if you go after 15:00 it half price. I recommend trying the left white slides and also have a go on the diving board. Very pleasant place for spend holiday. Different amusements- from rather extreme to very calm. I liked it. We spent there about 6 hours. Wish to return there next time I have trip to Chania! For a family of 4 we find this too expensive so was wondering if you have a family ticket for the water park. It looks like terrific fun!!! I'm not sure if you can get a family pass for 4 of you at Limnoupolis Water Park, but you can surely grab a discount by booking for family-members together a few days prior to your visit.